Business buyers are extremely well-informed about the plethora of choices available to solve their business challenges. Great content, therefore, needs to be at the heart of your B2B marketing initiatives in order to win buyers over. The marketing landscape today is a highly competitive one. As traditional advertising continues to lose its charm, marketers are continually on the lookout for new, innovative ways to get their voices heard. It’s slightly more challenging for B2B marketers because business buyers are more informed and conduct more research than consumers before making a purchase. So, flashy promotions or offers generally prove to be ineffective at winning over business buyers. However, great content can certainly help you get their attention, win their trust, and build long-term relationships with them. Here are 4 of the best types of content that B2B marketers can use to generate leads effectively. A study by Ascend2 found that research reports are the content type that drives the maximum leads and also the highest conversion rates. High-quality research reports can help grab the attention of your buyers effectively. They also help you gain their trust and establish yourself as an authority figure in your industry. When you work on creating research reports, make sure to pick topics that your audience is likely to be interested in. The more informative your content is, the higher your chances are of getting quality leads. Research reports can help you establish yourself as a thought leader and a trusted resource. They can help you create stronger relationships with your audience. So, leverage your website, email newsletters, social media, and even paid ads to promote your research reports to reach a wider audience and get more leads. Webinars are a great form of content that can help B2B brands generate quality leads. In fact, 55% of B2B companies leverage webinars as a part of their content marketing strategies. The best part about webinars is that they allow face-to-face interactions with your prospects and customers. This is a great way to humanize your brand and win the trust of your prospects by sharing informative content. Webinars can help you create a stronger connection with your audience and educate them about the benefits of your services or products. However, remember not to use content that’s overly promotional. Your objective should be to make your audience aware of their business challenges and subtly inform them about how your solutions can help solve their problems. At the end of the webinar, you can follow up with the attendees (and even the ones who registered but did not attend) to take the discussion forward. You can also record your webinars and display them on your website, as this can be an additional source of lead generation. Users can download and watch the webinar at their own convenience. Emails are still one of the best forms of content that B2B companies can leverage for lead generation. In fact, in a survey by CMI, 93% of B2B marketers reported that they use email newsletters to distribute content. However, the best way to make your email marketing more effective for lead generation is to use personalization. For this, you’ll need to create different buyer personas based on the common characteristics of your customers. You need to segment your buyers based on their firmographics, demographics, and psychographics. Then, you’ll need to tailor your communications to make them relevant for each of your personas. This will make sure that the right messages reach the right people. A study by HubSpot revealed that personalizing emails based on buyer personas can increase email click-through rates by 16%. So, personalize your emails based on the customer segment you’re reaching out to. 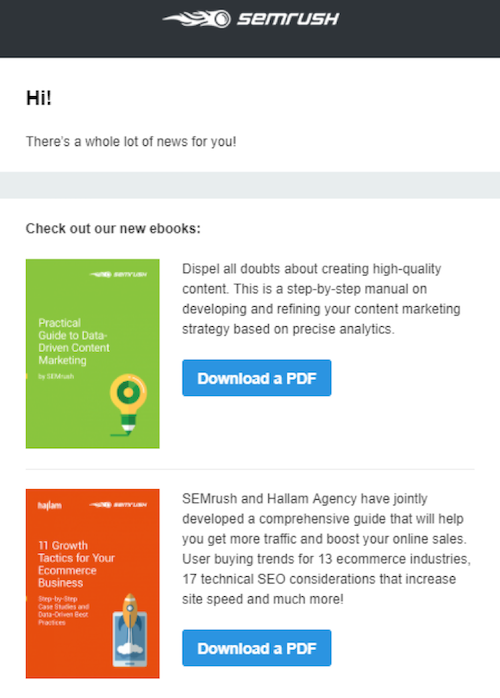 Here’s an example of an email from SEMrush in which it shared information about some of its e-books. When you click on the download link, you’ll be taken to a lead capture form that you need to fill out in order to view the content. This is an effective way to use emails for lead generation. To make it easier, you can integrate your CRM system with your email software to send targeted emails automatically to your prospects and customers. CRM systems such as Salesmate allow you to draft engaging emails using their built-in templates, so you don’t need to spend hours on them. You can even get notifications when recipients open your emails or download the content so that you can have your sales teams reach out while your leads are warm. According to a study by Ascend2, videos are the second-most effective content type for lead generation and increasing conversions. Videos can help convey emotions much more effectively than images or text due to their interactive nature. This allows them to leave a more lasting impression in the minds of your audience. Videos are also more engaging and fun to watch. They can help your audience access information easily and effectively without having to go through pages and pages of boring text. This is what makes them one of the most effective forms of content for both B2B as well as B2C brands. How-to videos that help prospects learn how to overcome their challenges using your solutions can be helpful to get people to convert. They can also help engage your prospects and pique their interest. Similarly, product demo videos or case studies can be very effective for lead generation. Just lock the content behind a lead capture form so that people need to fill it out to view the content. Many B2B marketers are of the opinion that B2B marketing is much more restrictive than B2C marketing. It doesn’t allow them to explore and experiment with the countless quirky ideas that B2C marketers can. However, B2B content doesn’t necessarily need to be boring and text-heavy. You’re likely to drive away your buyers if you aren’t able to create fun, attractive, and engaging content. In this respect, B2B marketing is quite similar to B2C marketing. The content types mentioned above are some of the most effective ones for B2B lead generation. So, leverage them and take your business to new heights with content marketing. This article was originally published on Clutch on February 5, 2019, and was written by Shane Barker.